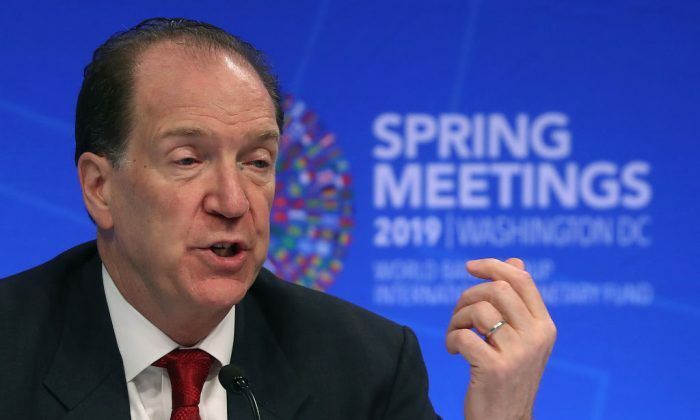 WASHINGTON—The World Bank will reduce lending to China, said the bank’s new president, David Malpass, who has been a longtime critic of Beijing and its ambitious One Belt, One Road Initiative (OBOR). In economic terms, China has evolved over the past few decades and become much stronger, Malpass said at a press conference on April 11. According to him, China is no longer a developing country that depends on loans from the bank. The World Bank’s mission is to lift countries out of “extreme poverty.” Despite being the world’s second-largest economy, China has benefited from the bank by borrowing billions of dollars. As of June 30, 2018, the bank’s cumulative lending to China was nearly $62 billion for more than 400 projects. China’s role should evolve from “a major borrower” to a “much smaller borrower,” Malpass said. When the World Bank increased its capital last year, shareholders agreed that the loans to China would fall below a billion dollars. “For some time now, the borrowing by China has been going down. That’s part of the evolution of the relationship,” Malpass said. He stressed that the bank’s focus should shift toward supporting development projects in poorer countries. According to World Bank calculations, global growth slowed down throughout 2018, falling 2.7 percent in the fourth quarter, down from 3.3 percent in the first quarter. And this deceleration has coincided with “waning structural reforms in major economies, financial stress in some large emerging markets, and elevated policy uncertainty globally,” he said. He warned that income growth in sub-Saharan Africa would remain below the 1 percent level for at least two years, which would worsen the extreme poverty in the region. Under his leadership, the bank also is expected to put pressure on Beijing to be more transparent in lending for its international-development plan, OBOR. Malpass, however, didn’t rule out cooperation with China to help reduce poverty in Africa. “In some countries, they are making good progress and we want to support that,” he said. Malpass, President Donald Trump’s pick to be president of the World Bank, was unanimously approved by the bank’s executive board on March 5. He has been an outspoken critic of the bank and other multilateral institutions. He took office April 9, just in time for the spring meetings of the bank and the International Monetary Fund (IMF) in Washington this week. He succeeded Jim Yong Kim, who abruptly resigned in January before the end of his term. Prior to the World Bank, Malpass served as Under Secretary of the U.S. Treasury for International Affairs, where he was involved in the trade negotiations with China. He was also former chief economist at Bear Stearns, serving the investment bank for six years preceding its collapse and merger with JPMorgan Chase. The United States traditionally selects the president of the World Bank, which is currently made up of 189 member countries. When the World Bank and IMF were created more than seven decades ago, a deal was made between the Americans and Europeans that the United States would elect the World Bank president, while the Europeans would designate the IMF’s managing director. Speaking at a separate press conference, IMF Managing Director Christine Lagarde said they have already begun working with the World Bank to improve transparency in lending practices, by monitoring terms and conditions, volumes and maturities of loans. “We are constantly encouraging both borrowers and lenders to align as much possible with the debt principles that have been approved by the G-20 and that we have endorsed internally and developed ourselves,” Lagarde said. The Trump administration has been a vocal critic of China’s OBOR, claiming that the project has turned into a “debt trap” for many emerging countries. OBOR involves massive construction projects that are financed mainly through a wide range of Chinese local government and state-controlled institutions. Some of these projects are co-financed by the World Bank and other multilateral development banks. Critics worry that China is using debt as a tool to gain political and economic leverage over other nations or their silence about the Chinese regime’s human-rights violations. At last year’s G-20 summit in Buenos Aires, Argentina, member states raised concerns about financing practices, including infrastructure funding around the world. They urged the IMF and the World Bank to help improve transparency in lending. “We call on the IMF and World Bank to work with borrowers and creditors to improve the recording, monitoring, and transparent reporting of public and private debt obligations,” the summit communiqué said.